Genuine OEM Dell Imaging Drum, 24,000 page yield. Dell part number: 330-3017, K110K, C920K. Imaging Drum compatible with Dell 1230cn, 1235cn. Compatible Dell Toner Cartridge, Cyan, 1,000 page yield. Replaces Dell part number: 330-3015, J069K, C815K. Color Laser Toner Cartridge compatible with Dell 1230cn, 1235cn. Compatible Dell Toner Cartridge, Magenta, 1,000 page yield. Replaces Dell part number: 330-3014, J506K, D593K. Color Laser Toner Cartridge compatible with Dell 1230cn, 1235cn. Compatible Dell Toner Cartridge, Yellow, 1,000 page yield. 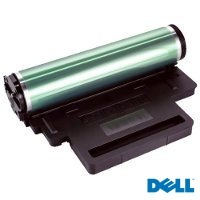 Replaces Dell part number: 330-3013, M127K, F479K. Color Laser Toner Cartridge compatible with Dell 1230cn, 1235cn. Compatible Dell Toner Cartridge, Black, 1,500 page yield. Replaces Dell part number: 330-3012, N012K, Y924J. Laser Toner Cartridge compatible with Dell 1230cn, 1235cn.